Other quick and easy temporary measures for stopping pipe leaks include wrapping waterproof tape over the bad spot or rubbing the hole with a stick of special compound. Applying epoxy paste or inserting a self-tapping plug into the hole are other alternatives. When using waterproof tape, be sure to dry the pipe thoroughly before you start wrapping. Start the tape about 2 to 3 inches from the hole and extend it the same distance beyond. 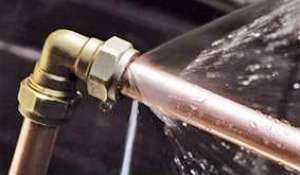 For tiny leaks in pipes, use a compound stick available at most hardware stores. Simply rub the stick over the hole to stop the leak. The compound stick can even stop small leaks while the water is still running in the pipe. Epoxy paste can be applied only to dry pipes, and the water must be turned off. The problem with all of these solutions is that a pipe that's bad enough to spring one leak often starts leaking in other places too. You may fix one spot only to see the pipe burst somewhere else. Especially in cases where the leak results from corrosion, the whole section of pipe will probably need replacing.